This blog will show you what the effect is on your Citrix XenDesktop/XenApp 7.5 environment of reinstalling your vCenter server. It will show you what will go wrong and how you can determine if it has. It’s a short blog but hopefully it will help you when facing the same issues or prevent it when you think about reinstalling a component. Got a message from a customer saying the vCenter server was reinstalled and since then the catalog couldn’t be updated. The screenshot below shows the error, take a look at the ErrorID, it says Failed to create image preparation Vm. Below the errorID is also a error message that says it can’t retrieve the network with reference Network-18. I’ve been thinking long about it and came to the conclusion that it had to be a network parameter that Citrix creates when setting up the connection with the hypervisor. There is no network with that name in vSphere to my knowledge. TIP! 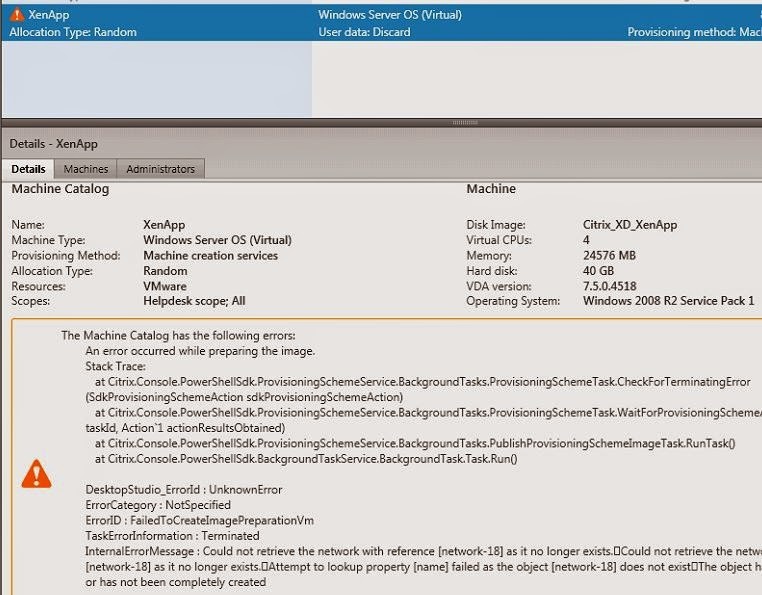 : Never change any network in vCenter being used with Citrix after you set up the hosting connection, it will break your Citrix environment. So having seen that the first thing to do is to check out the hosting connections, perhaps the connection is lost or something else is wrong. 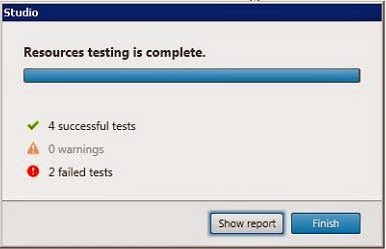 The hosting connection is made up out of two pieces, the hypervisor connection and a resource connection, both have their own testing options..
First off you have the hypervisor connection that is talking to the SDK. In the properties of the connections nothing is found that might alert you. Secondly there is the resource talking to the network and the storage. 2 Warnings, hmmm that might be interesting. 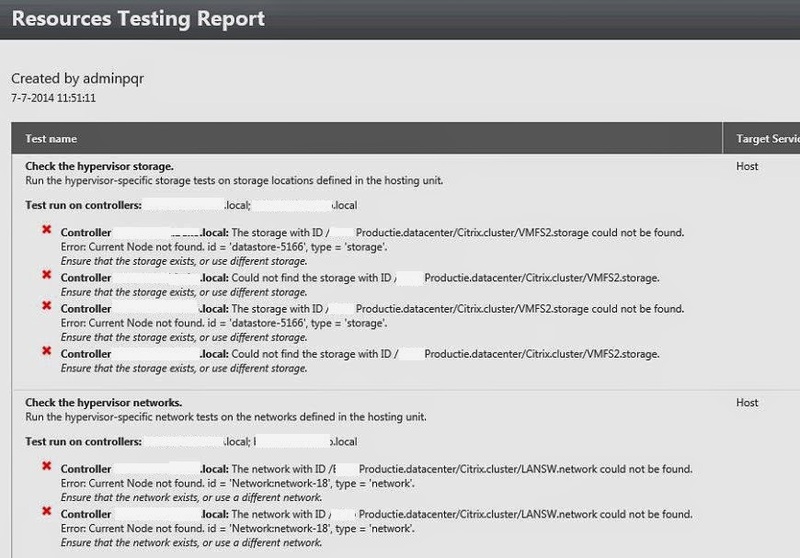 The report is shown below and it clearly states that where the root cause of the error is, the storage and network connection with the vCenter server are lost. The reinstallation of the vCenter server killed the connection and Citrix is in a forest now wondering where to look. 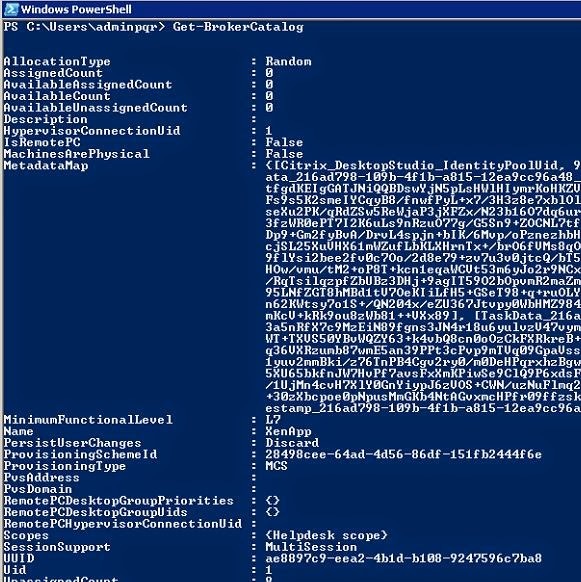 So I took a look at the catalog and hosting connection via Powershell, perhaps I can change settings there. The network that is listed in the error is shown here too, the storage and network are also listed of course. When I look at the vCenter installation, the names of the components are all okay so from a surface level all should be fine. Underneath there might be an issue but I have no clue on how to figure that out. Looking at the hosting connection there is no option I can think of to change settings. From the GUI I can change the storage choice but I don’t think that works when the connection is broken as it is. I created a new hypervisor hosting connection and noticed that the networkID changed, the rest seems to be the same as we seen in the non-working one. I deployed a catalog with this connection and it deployed just fine. I took one last look at commands to figure out if there was one that helped me connect a catalog to the new hosting connection but I can’t seem to find that…. that would mean that I have to recreate the catalog to use the new hosting connection. So after a few hours debugging last night I set of fixing it. As you have read before creating a new hosting connection fixed the communication with VMware vSphere. The broker connection only was able to give power options to the virtual machines, not enough. So the connection is established let’s bring down the environment. First I kicked all users still “working” of the server, politely but firmly… got some work to do. Next step was to put the servers in maintenance mode and give them a forced power down. Seconds later all Citrix XenApp servers were down. Walk over to the Catalog and delete it, remembering the settings for in a minute you will recreate it. So after the catalog is deleted I created a new one, MCS, 8 machines (small environment) 24GB memory, 4CPU’s and 40GB disk. Creating the catalog took about 10 minutes or less, copying the disk took the longest. After creating the catalog I went over to the delivery group and added all 8 machines to the delivery group. The Citrix environment was up and running again… not that much work when you know what to do. The tip in the blog is important, never change a component in your network without realizing what the consequences are on others.. make a risk plan before you do this. Citrix has been and still is picky about components talking to each other, the slightest thing will kill it. This was not a minor change so that it broke Citrix as it did is not something I wondered about. What I wonder about is why you can’t validate a connection or connect a catalog to a new hosting connection, that would make life a lot easier.